is a must-have ornament for bedroom, child room, living room, bar, shop, cafe, restaurant etc. *An Innovative fancy piece of stunning art Calming light, hurtless to eyes. *Durable Acrylic lampshape material, Refined Construction, Safe to touch--Perfect night light gift for children. *Eco-friendly, USB Powered for Low Engergy Consumption with enduring LED life span: 10000hours. *User- Friendly Operation Smart Design: 7 LED colors automatically changing mode & Simple Touch Button Operation. 1. It may have a protective film on surface of the light, please tear it out before you use the light. 2. 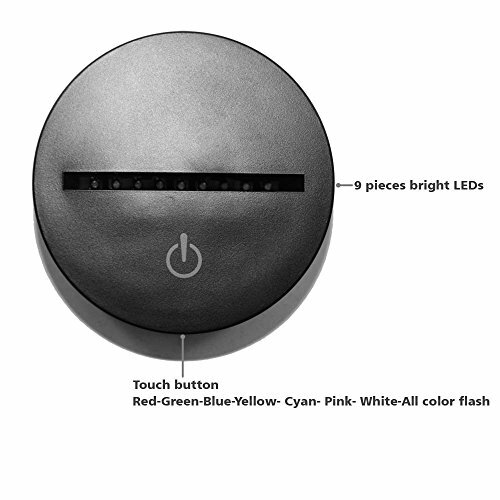 To change color, Press one time, one color light up, press it again, it turns off. Press it thirdly, another color light up. 3. For Automatic color-changing mode, Press the touch button to last color, then press it again, auto color changing mode works. An Innovative fancy piece of stunning art Calming light, hurtless to eyes. Durable Acrylic lampshape material, Refined Construction, Safe to touch--Perfect night light gift for children. User- Friendly Operation Smart Design: 7 LED colors automatically changing mode & Simple Touch Button Operation. Eco-friendly, USB Powered for Low Engergy Consumption with enduring LED life span: 10000hours. A Notable & Compelling Decor: Can be put in bedroom, child room, living room, bar, shop, cafe, restaurant etc as decorative light.